La Bamba is a 1987 American biographical film written and directed by Luis Valdez that follows the life and career of Chicano rock 'n' roll star Ritchie Valens. The film stars Lou Diamond Phillips as Valens, Esai Morales, Rosanna DeSoto, Elizabeth Peña, Danielle von Zerneck, and Joe Pantoliano. The film depicts the impact Valens' career had on the lives of his half-brother Bob Morales, his girlfriend Donna Ludwig and the rest of his family. Richard Steven Valenzuela is a normal teenage boy who becomes a rock 'n' roll superstar under the stage name Ritchie Valens. He meets and falls in love with high school classmate Donna Ludwig, for whom he writes a song that becomes a number two hit, ("Donna"). However, Donna's father has issues with his daughter dating a Mexican-American, which causes friction between Ritchie and Donna. Ritchie's relationship with his mother Connie and half-brother Bob Morales, and the jealousy Bob feels toward Ritchie's success are also depicted. Bob wins an important art contest that helps promising cartoonists, only to throw away his prize because, in his mind, his mother does not care enough. Bob resorts to drinking heavily and, at one point, yells in a drunken rage in front of his mother's door, "I want to see my daughter!" in reference to the child he sired with Ritchie's first girlfriend Rosie. However, when they get an opportunity, Ritchie and Bob sneak out for a good time. On one occasion, they take a road trip to Tijuana, visiting one of the local clubs where Ritchie discovers what will become his signature song, "La Bamba". Ritchie has a fear of flying, triggered by a recurring dream resulting from a midair collision between two planes over Ritchie's school which killed his best friend. Ritchie initially manages to avoid flying to his concerts and appearances, but has to conquer his fear when invited to perform "Donna" on American Bandstand. Ritchie's record producer and manager, Bob Keane, helps him by giving him a little vodka to calm his nerves during the flight to Philadelphia. As Ritchie becomes more famous, his responsibilities change, and he eventually joins the ill-fated Winter Dance Party tour with Buddy Holly and "The Big Bopper" after "La Bamba" and "Donna" reach the top of the Billboard charts. Ritchie, Holly, and Bopper take off in an airplane during a snowstorm for their fateful flight on February 3, 1959. Before the flight, Ritchie makes a call to his brother, wherein they patch up their differences. He even invites Bob to fly out to Chicago to join the tour for family support. The next day, while Bob is fixing his mother's car, he hears the news bulletin on the radio that his brother's plane crashed without any survivors. Bob darts out of his driveway in an attempt to get to his mother before she hears the news, only to find her standing immobile. The news of Ritchie's death hits the Valenzuela family, Bob, and Donna very hard. After Ritchie's funeral at San Fernando Mission Cemetery, Bob walks across a bridge and screams out Ritchie's name, remembering the good times they had together, accompanied by the Santo & Johnny instrumental "Sleep Walk". During the end credits, Lou Diamond Phillips, as Ritchie, is shown in footage from an earlier scene performing Valens' version of "La Bamba". Katie Valdez (Luis' daughter) as Ritchie's sister Connie Jr.
La Bamba opened in wide release in the United States on July 24, 1987. In the Philippines, it premiered on September 10, 1987. In Australia it opened on September 17, 1987. In its opening weekend, the film grossed a total of $5,698,884. La Bamba eventually grossed $52,678,820 in the United States in 12 weeks. Roger Ebert liked the film and the screenplay, writing, "This is a good small movie, sweet and sentimental, about a kid who never really got a chance to show his stuff. The best things in it are the most unexpected things: the portraits of everyday life, of a loving mother, of a brother who loves and resents him, of a kid growing up and tasting fame and leaving everyone standing around at his funeral shocked that his life ended just as it seemed to be beginning." Janet Maslin, writing for The New York Times, was impressed with Lou Diamond Phillips' performance, and wrote, "A film like this is quite naturally a showcase for its star, and as Valens, Lou Diamond Phillips has a sweetness and sincerity that in no way diminish the toughness of his onstage persona. The role is blandly written, but Mr. Phillips gives Valens backbone." The review aggregator Rotten Tomatoes reported that 96% of critics gave the film a positive review, based on 28 reviews, with an average rating of 6.8/10, with the consensus; "Elevated by a perceptive performance by a perfectly cast Lou Diamond Phillips, La Bamba distills its subject's creative energy -- and reflects his music's enduring appeal". Broadcast Music Incorporated: BMI Film Music Award, Carlos Santana and Miles Goodman; 1988. Golden Globe Award: Best Motion Picture - Drama; 1988. Because the movie is a celebration of 1950s rock and roller Ritchie Valens, his music and the music of his contemporaries play a central part in the film. An original motion picture soundtrack album was released on June 30, 1987 on Warner Bros. Records. The album contained 12 tracks. The first six songs consist of Los Lobos covers of Ritchie Valens' songs: "La Bamba", "Come On Let's Go", "Ooh My Head", "We Belong Together", "Framed", and "Donna". Other performers include: Howard Huntsberry, Marshall Crenshaw, Brian Setzer, and Bo Diddley performing a new version of his blues classic "Who Do You Love?". Some songs like The Big Bopper's "Chantilly Lace" were omitted from the release. Other omitted songs were "Oh Boy", "Rip It Up", "The Paddi Wack Song" (written by Valens), and "Sleep Walk" by Santo & Johnny (used in the final and initial scenes). La Bamba was filmed almost entirely on location in Los Angeles, California. Director Luis Valdez and the film's location manager, Richard Davis, wanted to include as many spaces from the San Fernando Valley as possible where Ritchie Valens and his family lived their lives. In an interview with Richard Davis, he describes Luis Valdez wanting "as many places that were actually in the story" to be included in the film so as to preserve the location's historical significance." For example, the film's opening sequence is filmed at Pacoima Junior High School where Ritchie Valens attended with his best friend. The sequence is a dramatization of the events on January 31, 1957, when two airplanes collided over Pacoima and the falling debris killed three students at Pacoima Junior High School, including Ritchie Valens' best friend. The death of his friend would influence Ritchie Valens' fear of flying in airplanes. Towards the end of the film, shots of the funeral procession pulling into the cemetery was filmed at the San Fernando Mission Cemetery at 1160 Stranwood Ave in Mission Hills, the real resting place of Ritchie Valens. Louis Valdez insisted on filming at Valens' final resting place, although Richard Davis stated the cemetery wasn't a very scenic place to shoot. The crew also ran into obstacles with the Catholic Church who was opposed to filming on location. La Bamba was one of several films to be released during the Hispanic Hollywood period in the American film industry, alongside films like Stand and Deliver, Born in East L.A. and The Milagro Beanfield War, which are films made by hispanic filmmakers containing hispanic themes. These films were made in part of Hollywood's attempt to target a highly profitable Spanish-speaking film audience after the notable box-office success of La Bamba. 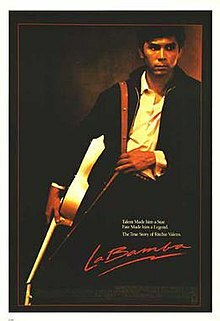 After the film's release, Victor Valle from The New York Times predicted that La Bamba "may have marked a turning point in the marketing of mainstream films to the Latino community." Director Luis Valdez was an active member of the Chicano movement who served as one of the four authors of the Plan Espiritual de Atzlán, a Chicano ideology manifesto. He also contributed to the Chicano movement by creating the El Teatro Campesino (The Farm Worker's Theatre) in 1965. Valdez's involvement in the Chicano movement and his study of Chicano nationalism are present in La Bamba. The opening dream sequence that foreshadows Ritchie Valens' death at the end of the film, for example, signifies Louis Valdez's study of neo-Mayan and Aztec philosophy and the Chicano folk practice of psychic readings of the future. La Bamba also reveals themes related to Chicano cultural nationalism and their identification with Mexican history and the transformation of Mexican culture. For example, when Ritchie Valens travels across the border to Tijuana and first hears "La Bamba," he becomes inspired by the Mexican folk song and adapts it into a rock n roll version upon his return to California. La Bamba appealed to Chicano activist audiences, as it was one of the first commercially successful films to feature a Chicano activist as the main protagonist. Prior to La Bamba, audiences had mostly experienced stereotypical representations of male, Mexican gangsters. The film also experienced complaints about the Filipino actor Lou Diamond Phillips playing the role of real life Chicano, to which Luis Valdez responded: "Why not? The Filipinos are the Hispanics of Asia, what’s the problem?" ^ Cannady, Sheryl (December 13, 2017). "2017 National Film Registry Is More Than a 'Field of Dreams'". Library of Congress. Retrieved December 13, 2017. ^ "Opens Today". Manila Standard. Standard Publishing, Inc. September 10, 1987. p. 10. Retrieved December 30, 2018. ^ "La Bamba (1987)". The Numbers. Nash Information Services. Retrieved November 27, 2007. ^ Ebert, Roger (July 24, 1987). "La Bamba". RogerEbert.com. Ebert Digital LLC. Retrieved April 10, 2018. ^ Maslin, Janet (July 24, 1987). "FILM: 'LA BAMBA,' A MUSICAL BIOGRAPHY". The New York Times. The New York Times Company. Retrieved April 10, 2018. ^ "La Bamba (1987)". Rotten Tomatoes. Fandango Media. Retrieved April 10, 2018. ^ "American album certifications – Los Lobos – LA BAMBA (SOUNDTRACK)". Recording Industry Association of America. If necessary, click Advanced, then click Format, then select Album, then click SEARCH. ^ a b c d e f g h "Cruise Through the Valley With These La Bamba Film Locations". L.A. Weekly. Retrieved November 13, 2018. ^ a b Rasmussen, Cecilia (January 28, 2007). "The day fiery disaster fell from the sky". Los Angeles Times. ISSN 0458-3035. Retrieved November 13, 2018. ^ Harrison, Scott. "From the Archives: Deadly 1957 midair collision over Pacoima - Los Angeles Times". Los Angeles Times. Retrieved November 13, 2018. ^ a b c d e f g Rosa Linda Fregoso (1993). The Bronze Screen : Chicana and Chicano film culture. Minneapolis: University of Minnesota Press. p. 31. ISBN 0816621357. OCLC 27894435. ^ Noriega, Chon A. Road to Aztlan : Chicanos and narrative cinema. p. 120. OCLC 613087613. ^ VALLE, VICTOR (1987-07-29). "'La Bamba' May Change Film Marketing". Los Angeles Times. ISSN 0458-3035. Retrieved 2018-12-08. ^ "About Luis | El Teatro Campesino". Retrieved 2018-12-08. ^ "30 Years Later, Luis Valdez & Esai Morales Reflect on the Impact of 'La Bamba'". Remezcla. 2017-11-22. Retrieved 2018-12-08.